London’s second largest airport is located in West Sussex but it has regular public transport links and road networks offering access to central London. The airport serves more destinations than any other in the UK. Our London Gatwick Airport guide includes airport contact details as well as information relating to terminal facilities, public transport options and nearby hotels. Plans for a high-speed rail link between London Gatwick and London Heathrow Airports, dubbed ‘Heathwick’ by the British press, are still being considered. Each arrivals concourse has an information desk where multi-lingual staff are on hand to deal with enquiries 24 hours a day. London Gatwick Airport is clearly signposted from the London motorway network, including the M25 (junction 7), which is a short distance away. London Gatwick Airport is directly accessible from the M23 motorway (junction 9) and the A23 (London to Brighton Road). The drive time to central London is approximately one hour. There is a free 24-hour shuttle train, which links the North and South Terminals (journey time: 2 minutes). London Gatwick Airport is located 45km (28 miles) south of London. Coach: There are more than 400 express coach services operating daily from the coach stations at both terminals. The main coach station is located on the ground floor of the South Terminal, with most services operating from here. Principal routes also stop at the North Terminal. There are desks providing coach information and tickets in the arrivals concourses of both terminals. EasyBus (www.easybus.co.uk) runs services to several stops in central London. National Express (tel: +44 871 781 8181; www.nationalexpress.com) operates services to London Heathrow Airport and central London from both terminals. The National Express Shuttle coach 25 connects to London Victoria Station and the journey time is approximately 1 hour. Oxford Bus (tel: +44 1865 785 400; www.oxfordbus.co.uk) links the North and South Terminals to Oxford; journey time approximately 2½ hours. The Gatwick Flyer (tel: +44 1708 730 555; www.gatwickflyer.co.uk) runs to destinations east of London, with connections to Heathrow and Stansted airports, departing from the South Terminal station only. Taxi: Taxi booking desks (tel: +44 1293 550 000; taxis.gatwickairport.com) are located in the North Terminal arrivals area and the northern entrance to the South Terminal; taxis wait outside the terminal buildings. Taxis can also be booked in advance via the airport website. Fares into central London are around £100. Rail: The railway station is adjacent to the South Terminal. The Gatwick Express (+44 345 850 1530; www.gatwickexpress.co.uk) runs every 15 minutes to London Victoria Station (journey time: 30 minutes; fares from £19.90 – 10% discount is available if booked online). The Thameslink (tel: +44 345 026 4700; www.thameslinkrailway.com) service stops at London St Pancras International (journey time: 50 minutes; fare: fare: from £9.50) and other London stations, before heading north to Luton and Bedford. Southern (tel: +44 3451 27 29 20; www.southernrailway.com) services connect the airport with London mainline terminals (journey time: from 30 minutes; fare: from £9.50) and the south coast. Information on all national rail travel is available through the 24-hour National Rail Enquiries line (tel: +44 345 748 4950; www.nationalrail.co.uk). Bureaux de change facilities and ATMs are available in the arrivals and departures areas of both terminals, open 24 hours. There are numerous restaurants, bars and cafés located in both terminals (both pre- and post-security), most are open 0400-2200 but some 24/7. There are many shops at London Gatwick Airport, including fashion boutiques, souvenir retailers and newsagents. Several duty-free outlets are available for passengers leaving the EU. The airport also offers home delivery and collection services for items purchased within the terminal. Left-luggage facilities are available in both terminals. A lost property service is also in operation; items are logged onto a database at lostproperty.org. Luggage trolleys are available for a refundable £1 deposit. Other available facilities at London Gatwick Airport include baby changing rooms, showers, a children's play area and prayer rooms. There are extensive business facilities and meeting rooms at the No.1 Lounge (tel: +44 8442 646 440; www.no1traveller.com) in the North Terminal – the new No.1 Lounge in the South Terminal offers similar services, with runway views, but does not have meeting space. However the Regus Express Business Lounge (tel: +44 800 756 2911; www.regus.co.uk) in the South Terminal offers a suite of business facilities, including meeting spaces for up to 12 people, which are bookable online. Business facilities – including telephone, fax, photocopy and secretarial services and conference and meeting rooms – are also available at London Gatwick Hilton Hotel (tel: +44 1293 518 080; www3.hilton.com) at the South Terminal, and at Sofitel London Gatwick (tel: +44 1293 567 070; www.sofitel.com) at the North Terminal. Wi-Fi internet access is available throughout London Gatwick Airport (the first 90 minutes of use is free of charge). There are also ChargeBox facilities in both terminals for charging mobile devices. Public telephones are located throughout the airport. Postboxes are located in the post-security departure areas of the South and North Terminals and at check-in in the North Terminal. Special assistance (tel: +44 344 892 0322; option 4) is available for disabled passengers. There are ramps and/or lifts where necessary, disabled toilets, induction loops and reserved seating. 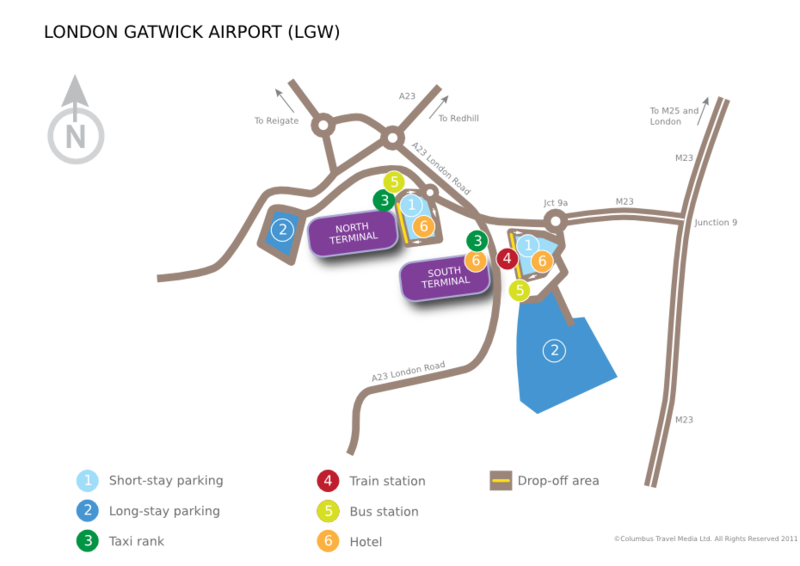 There is designated parking space for badge holders in the short-stay car parks linked to the terminal buildings. Wheelchair assistance and help with baggage is also available on request. Passengers requiring further assistance should inform the relevant airline before travelling. Each terminal has a short-term car park that’s linked via covered walkways. Long-term parking is available in car parks further from the terminals; a free shuttle bus runs between these car parks and the terminals. Passengers can book parking in advance, either via phone or through the website (tel: 0844 811 8311; www.gatwickairport.com). Valet parking is also available. Car hire companies represented at London Gatwick Airport include: Alamo, Avis, Budget, Europcar, Enterprise, Hertz, National and Sixt.